Global oil supply remained flat in the first quarter of 2015, as slowing shale output in the US was offset by OPEC and increased supply from "unsuspected corners," such as Vietnam, Malaysia and China, according to the International Energy Agency (IEA). Supply in the first three months of the year remained stable at 95.7 million barrels per day (bpd), the IEA said in its monthly Oil Market Report published Wednesday. Supply growth remained at 3.2 million bpd year-on-year in April despite slowing US light tight oil (LTO) output, the report said. "In the supposed standoff between OPEC and US light tight oil, LTO appears to have blinked. Following months of cost-cutting and a 60 percent plunge in the US rig count, the relentless rise in US supply seems to be finally abating," the IEA said. The report also noted that the oil market saw some newcomers, like Vietnam, Malaysia and China, adding that Russia and Brazil were also coping “unexpectedly well” with the oil price drop since the summer of last year. However, the recent rebound in oil prices to above $65 per barrel gave US producers a new hope for better income, the IEA said, adding that it would be too early to say the OPEC countries had won the battle for the market share. "The battle, rather, has just started," the IEA said. 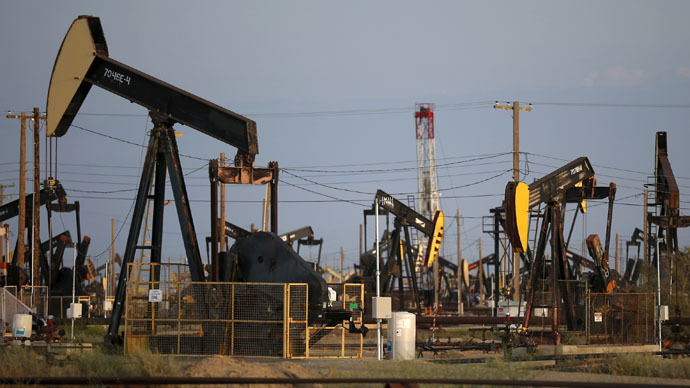 Oil prices rose on Wednesday, with Brent crude futures for June delivery up 0.5 percent at $67.19 a barrel on London’s ICE Futures exchange, at 14:50 MSK. WTI sweet crude futures traded at $61.17 a barrel, up 0.7 percent from Tuesday’s settlement. On Tuesday OPEC released a separate report where it revised up its forecast for oil demand in 2015, citing the economic recovery. Worldwide demand for oil will grow by 1.18 million barrels per day (bpd) to 92.50 million bpd in 2015 on higher consumption by Europe’s biggest economies, according to the organization’s monthly report. The US supply forecast has been cut as shale drillers begin to struggle. Half of this year's expected increase will come from China and the Middle East. "Despite the slow start in some countries, world economic growth could strengthen further as the year progresses, leading to an improvement in crude oil demand in 2015," the group’s report said. Oil prices have almost halved from $115 a barrel seen last year, and have rallied strongly to around $65 per barrel since the beginning of 2015. OPEC, which controls a third of the world’s supply of oil, refused to cut its output in November despite the price collapse. The group wanted to recover market share by slowing higher-cost production in the United States and elsewhere that had been encouraged by OPEC's previous policy of keeping prices high at around $100 a barrel.